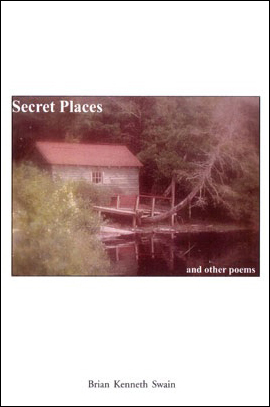 Secret Places by Brian Kenneth Swain is worth a look. This is a competent, well-balanced collection of free verse narrative poems that engage the reader in the author’s reflections on love, war, friendship, family, death and even Leonardo Da Vinci. “To An Old Friend Across the Ocean” is a fine example of the “epistolary” (letter) poem, written in this case to a dead friend. The poet discloses that he has written several letters to his friend in the past that have gone unanswered, until one day he finds an envelope from your address/ but with my name/ written in an unfamiliar hand. He discovers that the letter is from The one who lived with you./ The one who knew no English./ The one who tolerated/ my bad German. The poem is written in plain but powerful words (as one might actually write such a letter) and, as psychotherapists will tell us, it is a healthy thing to write a letter to a dead friend, particularly if there was no opportunity to say good-bye. The challenge in writing about one’s own problems is that it takes skill and good judgment to make the reader care about the author’s sorrow. The trick is to give the poem some punch but avoid being sappy and sentimental. Swain does it well with another epistolary poem, “My Friend Phillip,” which broaches the theme of suicide. How bad/ could things have been,/ that a family’s love/ could not assuage?// …I was two hundred sixty one miles/ away.// …I would have come./ You only had to call.// I would have come. One of my favorites in this collection is “Leonardo’s Lunchbox,” in which the author wryly speculates on the kind of midday meal the great philosopher, artist and inventor might have favored: I’m betting he was a/ bologna and cheese sort of fellow,/ no squishy formless egg salad/ for the master geometrician./ He would be drawn inexorably/ to the precisely circular/ slice of uniform pink meat.// …[and] a hard boiled egg,/ whose shape would have pleased him,/ and whose yolk-ensconcing allegorical qualities/ would have satisfied/ his most philosophical yearnings. Similarly appealing is the delightful “Gravity,” in which the poet declares, I remain stuck on this ball/ like a gnat on flypaper./ …I sit,/ a prisoner of physics,/ bound tight as a stamp on a letter,/ centrifugal force be damned.Swain goes on to say that gravity . . .unerringly/ draws the buttered side of my toast/ to the linoleum. It is not simply that the poems about Leonardo and gravity are humorous, but these poems are original and contain some of Swain’s best imagery.